all these attach to a story attachments seemed to be pushed enough to actually see play. All the attach to story attachments have had to many negatives to see much play but these all seem really good so far. Danigral - 2 out of 5. It’s very similar to the Bootleg Whisky conspiracy, and no one plays that. While this can certainly be annoying, it will only go in a government deck and you kind of have to do some hoops to really get a big impact from this. It can blank keywords which will be very cool, especially if you team up Agency with a monster faction or give them terror icons somehow. mnBroncos- 3 out of 5. I am skeptical that rating this to high because these attach to a story support cards haven’t really seen play in the past, from my experience. However, out of this box Agency’s best deck is arguably a heavy Government focused deck and this can fit right into that deck. Obtuse- 1 out of 5. Blanking texts boxes is nice and all, but this isn’t the best way to go about it. It’s totally avoidable, and unless you’re running all Government can hurt your own characters. I might rate it a little higher if it were 0 cost, but you actually have to drain a domain for this. Pass. livingend 2 out of 5. Blanking is not incredibly relevant at stories, especially when telegraphed. The really awkward part however is that By The Book also blanks your own non-Government characters and essentially blanks itself against other government decks. As a rule of thumb, support cards have to have (1) immediate impact and (2) significant impact on the game to be any good in a meta with Constricting Eldar Thing, Thunder in the East and other highly efficient options for support removal. Verdict: Better try to break the game than play by the book. WWDrakey & Ire - 3 out of 5. Obviously only for Government-centric decks, but making a Story inhospitable for cards like Claret Knight, Ancient Ones or Master of Myths isn’t all that shabby, if not game-winning either. I don't know if it will work, but I'm trying this card out in a mono-Agency deck that also runs 3x Catastrophic Explosion and Prize Pistol. 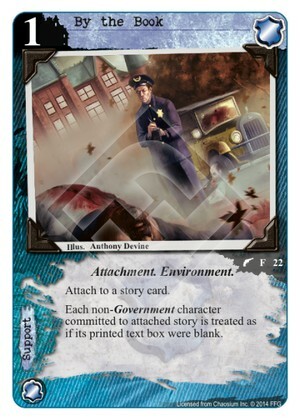 Whether I'm giving everyone on the board 1 wound with the Explosion - thereby making the attached story inhospitable for my opponent's characters - or using the Pistol to snipe characters who dare commit to the attached story, I feel like By the Book should play an important role in a Government deck. And while neither the Explosion nor the Pistol can still reach an Ancient One, they can control the rest of the board and leave the Ancient One to the mercy of all the combat icons on my side of the table.